Do Something: Book review: “Kisses from Katie” & “Love Does” and how to see the world through a different lens, not worldly expectations. I had some time to be in silence last week. As I was in the quiet, I was reminded from a song, “Do something” by Matthew West, and two books that are all about acting on God’s call to live by faith. I was reminded how important it is to MOVE, ACT and DO things for the causes of Humanity and also to express gratitude towards Jesus for all He has done for me. 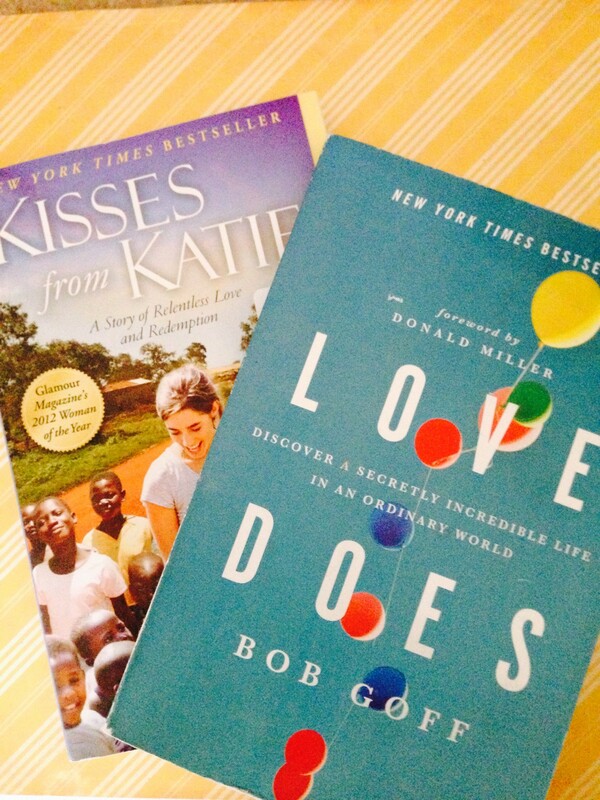 Also, while listening to the song, I thought on two books that show living faith in action: Kisses from Katie, By Katie Davis, and Love Does, By Bob Goff. And God has a heart for children, the poor, the widowed, the fatherless. And into the book review…There are two books that amazingly demonstrate the power of God through one person who decides to listen to His voice and act or “Do Something”. In the book Kisses from Katie, it is clear that Katie Davis is one person who listened, acted in faith, and has made an impact. It is not a story about how amazing Katie is…It is a story of what can happen to any of us if we choose to quiet ourselves, listen to God’s voice, and then act on God’s plan (not our own), regardless of what we think or others think. Katie’s story is so incredibly encouraging because she follows God’s word and God’s plan and shares all of the glory of God and His work. Her book and story is really God’s story that he offers to each of us–and is so encouraging to those of us who want to follow His lead. No, I, Rachel, can not pick up, move to Africa and adopt 10, 12, 14 girls. That is not the story God wrote for me. But I can do what He asks me to do where I am at. Also, Katie writes about the pull between her family–who are awesome, amazing and wonderful and Christian. They are well intentioned, but had plans for her to follow the normal American Dream…graduate from high school, go to college and have a successful career. She wanted to be a nurse. God still has given her opportunity to mend and tend to sick and poor people, but just not the dreams in the way in which her parents had imagined (or that she had imagined, for that matter). As a parent of three, I have dreams and hopes for each of my kids. I would love for them to experience education, success and wonderful things that I have experienced…or that I haven’t had the opportunity to experience! However, reading Katie’s story, even with her “worldly potential” being valedictorian at her high school, etc…..all of the opportunities she would have to go to an amazing college, chances to be a huge success–she listened to God’s voice of His calling. Not the world’s. As a follower of Jesus, it is very important that I let my children follow God’s voice, support them with good questions and prayer, and trust that God knows what He is doing. The second book that also speaks to the pledge to “do something”, as Matthew West puts it, is Love Does by Bob Goff. I have had the privilege of hearing Bob speak, which helped bring to life his voice in the book. The book is written as series of stories from Bob’s life. Some stories are extreme and crazy and many are hilarious! Each are examples of him stepping out in faith, or sharing what he has learned from Jesus. Bob lives boldly and his vivid personality comes through! I SO enjoyed each chapter (each chapter is a different story), I began to read them aloud to my offspring. The youngers loved them and were challenged to think outside the box. I also know for a fact, that Bob Goff WILL respond to your correspondence! One of my dear friends took the challenge to contact Bob. They ended up going to lunch with him! Both of these books have challenged me to live more boldly in my faith. I highly recommend both and will definitely read them again. I hope you are inspired to put your faith into action! Do you ever struggle with letting go of control? What is your response to not having control? Our impromptu mini ski vacation over Christmas presented me with some reminders about the word and practice of “control”. We were invited to join another family to go skiing for a few days. We had less than a week to plan, and we left the day after Christmas. Both Husband and I skied a bit when we were younger. After leaving “home” we each, separately took a few trips in college, and a couple more after being married, but the last decade and a half have been mostly void of skiing. For us, I suppose it is like “riding a bike”–we were able to pick up where we left off, with a few conservative corrections on my part, testing out my newer ACL and such. But all was great. Watching our kids learn to ski had moments that- for this mom- were utterly painful. First, we made mistake one. After taking too long to get settled, we missed the first morning lesson and had to go for the 1pm. “Well, we paid for these expensive lift tickets”…we weren’t going to waste time, or money…not our style…so we decided– instead of taking the time to hike up an incline with 12, 10 and 8 year old beginning skiers– we would just take them up the chair lift on the ‘bunny slope.’ It wouldn’t be too hard….right?? We all dismounted the chair and got to the right side of the lift. And that is where we all stopped, for about…. well, 30 minutes, at least! First, husband took our middle son. He had the one-to-one ratio, which seemed a good idea. I watched the struggle a little bit, but didn’t have much time to focus on those two, as my own ‘projects’ were stuck with me. I had the oldest and the youngest. Oldest is brave and a go-getter. She is exceptionally balanced and takes risks as part of her nature. She has done things at ages I still can’t believe (like zip line thousands of feet high, through the Costa Rican Rain Forest Canopy for more than a mile stretch at age 7), and her resilience led me to believe that this wouldn’t be bad. Youngest, well he likes to “hit the ground running.” I think when he was just under one year old, he literally did start life running, instead of walking. He is also the youngest, so he likes to look at someone doing something (like ice skating recently) and just GO! This usually proves in a fail, and a fall, but he gets up and goes again. Despite these strengths, our first run of skiing was either comical, or terrifying. First, the steepest part of the bunny hill was the top. Second, none of our children understood our “wedge” conversation. None of them could stop. Third, the top of the slope was the most crowded, as everyone is getting off the chair, AND it is the most unpredictable slope since most everyone on that ski run are beginners. Skip ahead 20 minutes. My plans have failed. Oldest daughter is forming tears. Youngest son is on the ground and his tears, anger and frustration surfaced 10 minutes ago. I had candy bribes in my pocket and my supply is already exhausted. I am out of ideas. Husband and middle son are making their way down, unlike my troop. I have stopped and actually prayed for new direction or language, or something…anything… several times. I am now praying for no broken bones. I am fully at a loss and have no control. And let’s say, I didn’t become a better ski instructor under these circumstances. I will confess: I became worse. Oldest, she decides she is just going to have a go with it. She starts slowly, in a tense, hunched stance, working her way across the hill. Some of my instructions on “traversing the hill” are helping slightly. She is actually moving. She has been patiently waiting upon my word for quite some time and it is time for her to just go for it. She is making progress. Youngest and I are still stuck on the side of the mountain. Every time we decide we will try to move, some beginning screeches to a stop right near us, or youngest gets his skis crossed again. Honestly, my lack of control over his actions frightens me. I think my tension is making him increasingly tense. This, of course, is making things worse. Then husband arrives at the top of the slope. Angelic music chimes in my mind…and I think he may have a halo over his head. I am so grateful. I tell husband, “It is time for a new voice.” My plans and words and ideas are not good ones, and I failed. Youngest agrees. Mom failed. I have to laugh, because it is true and I tell him so. Trust dad. He will get you down the hill. And I have to turn my gaze down the mountain….ski toward the oldest who is still working her way down, and not watch the youngest. I don’t want to see. I don’t want to cringe…I just want to let go of control, pass it over to dad, and celebrate the success at the bottom of the slope. And honestly, after that first run, the kids were champs. All three of them. We decided that ski lessons with professional instructors were worth the money (and it wasn’t cheap, haha) and worth the few ski runs we could enjoy God’s beautiful creation together. And the kids amazed us. After three days they loved skiing. After our first ski run, this felt like nothing short of a miracle. It was definitely an answer to prayer. As they got progressively better, they took more risks. They each increased their speed. For this woman, turned mother, it is both wonderful and difficult to watch. Something changed when I bore children into this world. I feel like I have become a somewhat cautious wimp. I want to let go of control and let them soar. But I so want to make sure they are safe, unharmed, and warm and happy, too. And every muscle in my body just tenses at times, and I just have to close my eyes. In fact, even after riding chairlift after chairlift, I insist that they bar is brought down for safety every lift ride, and I just can’t help but put my hand over their lap, or hold their jackets. Letting go of control over life, over others….giving up control is such a difficult process. And I realize that much of what I struggle with is in an effort to hold onto control of my own life. My own plans. I am nervous with my husband driving…because I am not in control. I’m frustrated when plans change…because I have lost control. I cringe when my kids ride their bikes fast down a winding hill…because their decisions on when to turn or brake are out of my control. You see….it is never easy to let go of control. But control equals my own plans, and my own plans mean my own way, and my own way equals independence. We consider Independence as a wonderful quality, particularly in this country, but independence means on our own. And that includes on our own away from God. I remind myself of how much I WANT to let go and give my plans–well intentioned or not…my way, and my burdens ALL to God. That I actually have God in my life calling me to give it all over. Live each day for Him, with Him and by His plan. Let Him mold me, and make me into who HE wants me to be. That is actually so very, VERY freeing! I was driving in to work this morning, after having drafted this blog post and was thinking and praying on giving up control and I heard Tenth Avenue North’s song “Let it go…” Another personal reminder of the reality of grasping for control (so much that our “knuckles have gone white”), and the beauty of letting it go and giving it to God (“life is waiting for the ones who lose control”). Take a listen and join me in letting go…. I have been told that I am ‘random’ once or twice. I have these thoughts, and they are funny, but I keep thinking and I can’t help it. It’s just that… I think God does find us in the plain and simple. So, I allow these simple examples in life to speak to me, a little or a lot. I listen and then I thank Him…for the laugh. So bear with me a moment or two. It’s really cold outside. Well, 23° and windy, which is particularly chilly for a girl born, raised and living in the Pacific Northwest. And in cold weather, and/or quick weather changes, we lather it on. Especially lather it on the lips. 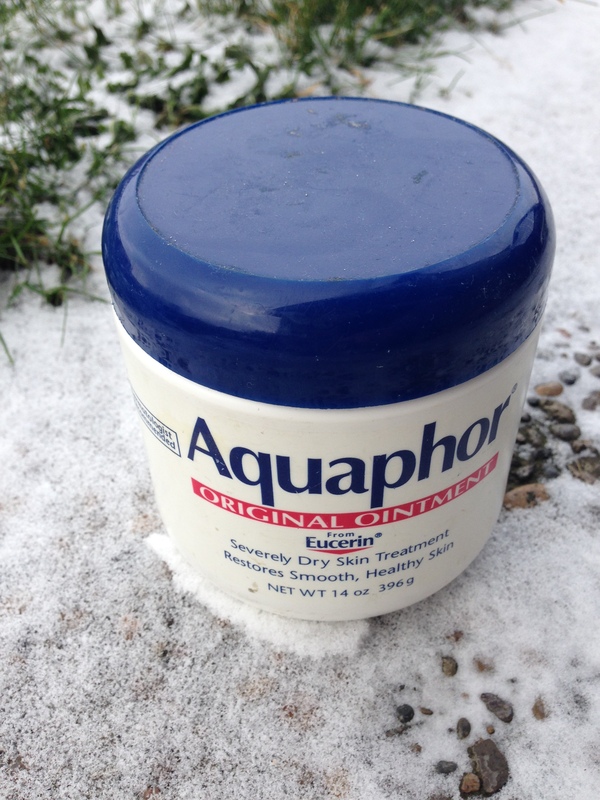 Random thought of the day: We have the ability to use a layer of Aquaphor, to prepare ourselves to go out in the cold. We know that we should put on a jacket, gloves, and, in our family’s case, Aquaphor. As parents, we try to send our children into the world, prepared. “Here’s a jacket, your gloves are here, and put Aquaphor on your lips.” These “tools” provide a protective layer in the frigid, ever-changing weather world. God provides us with tools: scripture, the Holy Spirit and prayer to mention a few. We can choose to read the Word, pray, and ask for protection and enter His presence. And I know that it is silly, random and strange to compare God to Aquaphor, but if you know me, you know I will do it anyhow! (obviously and truly there is no comparison). It’s just that He’s available to us, God provides that protective layer against all of the elements of the world. And then, at times, we forget to ask Him– forget to “put Him on”. And when we stray a little, or forget to include the Lord, there might be some naturally consequential damage (such as the chapped lips of this world, haha). But our God is amazing and He still can provide a layer of healing to make us better. We may suffer the consequences of chapped lips, for not thinking to “put on God first.” We forget. We decide to try it our own way. And then we might experience some pain and cracked skin. However, even after the damage, we can still put on the Aquaphor of God. He will heal. It doesn’t hurt when we ask and He heals us. That’s it. My random thought of the day. But, maybe next time you put on your Aquaphor, or whatever is your family’s “go to,” just maybe it will be your reminder to put on the armor of God as well.